ideal location, very quiet, with all the comforts, well-kept decoration, rural location, newly renovated with real wood floor, free admission to the hotel's own lake, free bike rental and toboggan rental, hand and bath towels are changed Wednesdays and Saturdays. We are a member of the BIG FAMILY the adventure club of 4 - 14 years. from 24. 06. - 6. 09. 2019 and from 30. 09. - 25. 10. 2019 available. Prices depending on season and without tourist tax, prices are based on two people, with more people there is an additional charge of EUR 20, - per person. From 25.05.-20.10.209 the Stubai Super Card is included in the price. Hair dryer, make-up mirror, facial tissues and shower gel and soap available. 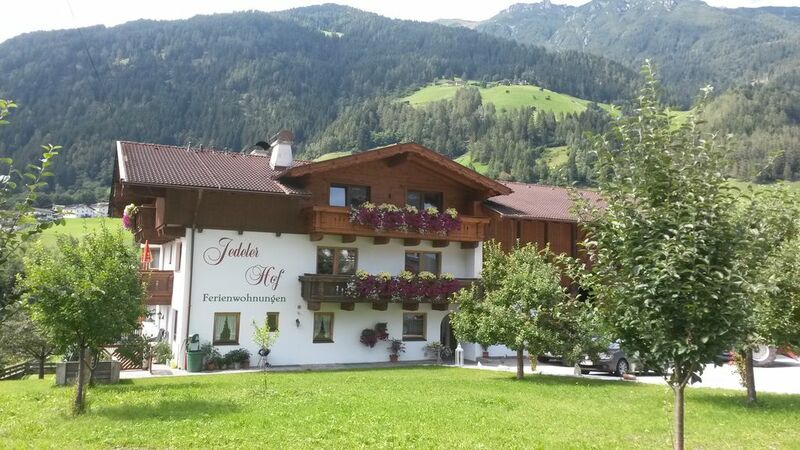 "Beautiful, very clean house with a great view, close to Innsbruck and the Stubaigletscher. There's some really good bikes that you can use for free. We found only two small things to improve: the supposed wifi-internet connection is too weak in Wohnung 3 and can only be catched in the hallway. And we weren't used to the owner entering your apartment while you're away to change towels in a rented apartment like this, instead of just putting them in front of your door. But the general impression is excellent." "Appartement spacieux, fonctionnel avec belle vue sur la vallée et les montagnes. Propreté irréprochable. Hôtesse discrète. Seul "reproche", semble ne pas maîtriser l''anglais parlé d''où échanges délicats." Wir sind sehr zufrieden gewesen." "Appartamento molto carino, con un ampio terrazzo e con vista incantevole. der angegebene Preis ist der billigste und wird saisonsbedingt angepasst. der Preis ist excl. Kurtaxe und Endreinigung und bezieht sich auf 2 Personen. Für weitere Personen ist ein Aufpreis ab EUR 18,- pro Tag zu bezahlen.